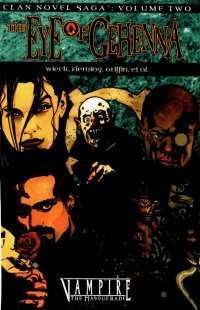 The Vampire Clan Novel series broke all records for World of Darkness fiction when, throughout 1999 and 2000, it told an epic story through cross-cutting novels and carefully time-stamped chapters. Now, the entire epic is represented in four beautiful tradeformat volumes. The Clan Novel Saga reorganizes the chapters from all 13 novels (and the Clan Novel Anthology) in strict chronological order, showing the progress of the epic night by night and even minute by minute. Volume Two covers the chaotic weeks from early July to early August 1999. Atlanta and other Southern cities fall to the Sabbat, foreign assassins converge on the scene, and the animalistic Gangrel threaten to leave their Kindred in harm·s way. Meanwhile, the dark design of the Eye of Hazimel unfolds. This volume includes all-new story by Stefan Petrucha (Dark Ages: Assamite) about the deadly Assamite Fatima al-Faqadi. The same issue as Brett R. Terrible oversite. Get it fixed please.